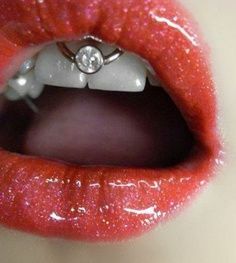 Flat Back Ball Closure Rings or Captive Bead Rings as they are sometimes called are fantastic for Smiley Piercings (which is a piercing of the inside of the upper lip (frenulum). This piercing is not suitable for everyone as there needs to be enough flesh to pierce, please check with your piercer and take their advise. If there is not enough skin the piercing may grow out (or migrate), or you could get an infection or tear the skin. The jewellery worn in a smiley piercing is usually either 1mm (18 gauge) or 1.2mm (16 gauge) and we think that these flat back bcrs are fantastic because they have a flat disc (plain or jewelled) that shows under your top lip when your mouth is open. They are much comfier than balls because they are flat so do not irritate the teeth and gums. 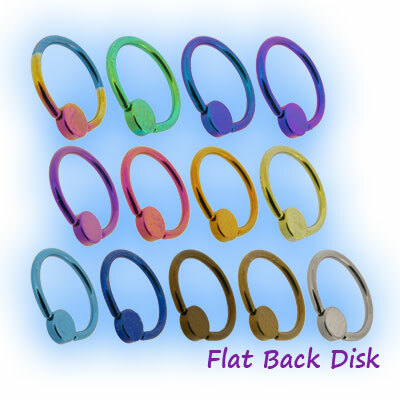 We have just added some plain flat backs to our range which do not have a jewel, these are Grade 23 Titanium (6AL-4V eLi) and are available with a highly polished (silver) finish or anodised (coloured) in Bronze (Gun Metal), Ice Blue, Blue, Yellow, Peach, Pink, Purple, 2 Tone Purple Blue, Teal (2 Tone Purple Green), Green and Rainbow. They are available in 1mm (18 gauge) with either a 7mm, 9mm or 11mm diameter or 1.2mm (16 gauge) with a 7mm, 8mm, 9mm, 10mm, 11mm or 12mm diameter. The discs are 4mm and are held in place by the ring itself. The discs have tiny dimples either side which fit into the ring and are held in be pressure. They are fitted by putting one side of the ring into one dimple then applying slight pressure to the other side which wil then clip into place. It is always advisable to practise clipping the ball in and out a few times before fitting them into your piercing to make sure that you are comfortable with what ou are doing. We also have Titanium Rings with Jewelled discs in the same sizes available with a massive choice of Titanium colour and gem colours. Steel and Gold Plated Jewelled Flat Back Rings are also available in both 1mm and 1.2mm with lots of different choices of gem colours. Our full range is here. Flat back rings are also suitable for other piercings such as ear piercings, they are very poplar for upper ear piercings (such as helix) because the discs are flat making them comfortable to wear (and sleep on) and they sit nicely on the ear.